Playing primarily out of Montclair Golf Club, Cudone won 20 state amateur championships, including 10 in New Jersey, six in New York and four in South Carolina. From 1968 through 1972, she won five straight U.S. Senior Amateur titles, becoming the only person, man or woman in any division, to ever to win five consecutive U.S. amateur titles. In 1961, at the age of 42, she finished ninth in the U.S. Open. Cudone also played on the 1956 U.S. Curtis Cup team. 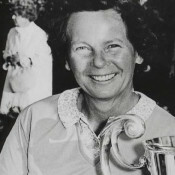 In 1970, she was appointed the team's captain and was named Golf Magazine's Amateur of the Year.